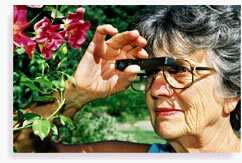 Macular degeneration glasses for distance vision are as important as magnifiers are for reading. These glasses make it possible to watch TV, recognize faces, see street signs, enjoy a play, are cheer for your favorite sports team. Henry A. Greene, O.D., F.A.A.O. is an optometrist and the founder of Academy Eye Associates, and the co-founder of Ocutech, Inc, a company that develops innovative hi-quality bioptic telescopes for the visually impaired. He serves as a clinical professor in the Department of Ophthalmology at the University of North Carolina. As a researcher and developer in the field of low vision, he has been the principal investigator on National Eye Institute and Canadian Institute for the Blind funded projects to develop vision aids for those with macular degeneration and other eye conditions. 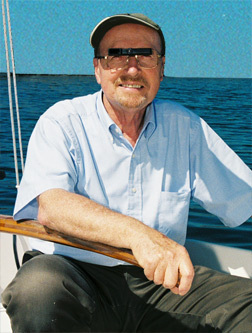 In 2008 he received the William Feinbloom Award from the American Academy of Optometry. The William Feinbloom Award is given each year to a person who has made a significant contribution to the clinical advancement of visual and optometric service, and thus the visual enhancement of the public. Perhaps you have never heard of bioptic vision and how these macular degeneration glasses can improve your distance and mid-range vision. 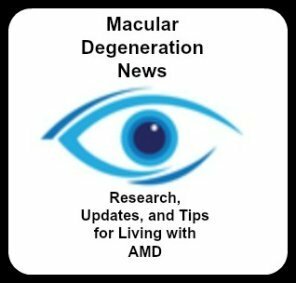 Find out more as Dr. Greene explains how they work and who can benefit from these glasses through this e-interview with WebRN Macular Degeneration readers. 1. Tell us how bioptic telescopes work and how they are useful for distance vision. When vision is affected due to macular degeneration, glaucoma, diabetes, optic atrophy, albinism, nystagmus, or other hereditary or acquired visual disorders, central vision, which is responsible for enabling us to see details, is reduced. Conventional eyeglasses or contacts no longer helpbecause the retina or optic nerve cannot produce a clear image, not because the image is out of focus, although it may certainly appear that way. Not only is reading difficult, but seeing signs, faces, TV and the computer are also impaired. While magnifiers and large print can help reading, only moving closer or using miniature telescopes can help you to see better at midrange distances or beyond. Reading is usually done at home or in isolated situations. Distance vision, however, is often a public activity, and impacts social interaction and hence quality of life. The loss of the ability to see the world around you, read body language and make eye contact can be isolating and can contribute to depression amongst the visually impaired. Telescopes help by making the image larger, allowing the user to see things further away. For instance, if an individual can only see a loved one’s face no further than 5 feet away, when looking through a 4x power telescope they may now be able to see their face from 20 feet away. When a miniature telescope is attached to the top of a pair of eyeglasses it is called a bioptic telescope. By attaching the telescope to the eyeglasses, the wearer can switch their sight between their "regular vision" and the “magnified vision” through the telescope by just a slight downward tilt of the head. Bioptic telescopes can be worn just like a regular pair of eyeglasses, are fast and convenient to use, and become automatic in short order. 2. What activities would a person use these telescopes for? Bioptic telescopic systems can be helpful for viewing television, movies and theater, seeing faces, signs, blackboards in school, shopping, traveling, table-top activities including card and game playing, and mid-range activities such as reading music and the computer. Bioptic telescope users have even used their devices to drive, hike, golf, bowl, paint, fish and mow the lawn. selecting telescopic glasses for improving distance vision? Keplerian telescopes use a complicated combination of lenses and prisms to produce the widest field of view and sharpest edge-to-edge image possible. Galilean telescopes contain fewer lenses and no prisms making them smaller and lighter, but since they provide a narrower field of view and less edge sharpness they are most valuable in lower magnification powers. As telescopes increase in power, they increase in length and their fields of view decrease in size. In lower powers (2x to 3x) Galilean optical designs can provide ample fields of view for most purposes, however above 3x the wider fields of view of Keplerian optical designs are usually preferred. 4. How would someone with macular degeneration benefit from bioptic telescopes? Who is a candidate for distance glasses? Individuals with visual acuity as poor as 20/400 (6/120) have found bioptics to be helpful. The individual's specific visual needs, established in consultation with their low vision specialist, will determine which device and power will be most appropriate to achieve their functional goals. Ocutech has devised a simple questionnaire to help individuals with vision loss determine if they might be a promising candidate for bioptic telescopes. •	Is your vision loss due to macular degeneration or a similar disorder that causes a loss of central, detail vision? •	Is vision in the better eye with your best eyeglass prescription (if used) 20/400 (6/120) or better? •	Can you read headlines on a newspaper with your regular reading glasses? •	Can you watch TV or recognize people's faces from further than 2 feet away? •	Do you understand that this device is designed to help you see better at distance and midrange for faces, signs, TV, computer screens, shopping and traveling? 5. What makes Ocutech bioptic telescopes different from other brands that may be available? Ocutech’s Keplerian optical designs, called VES systems, are an innovative combination of telescopic and periscopic optics. Researched and developed with funding from the National Eye Institute (NIH) they are designed to address the needs of users by providing a wide field of view, light weight, bright and sharp optics, and an appealing design. They are the only Keplerian bioptic telescopes that offer this combination of features that experienced users prefer. 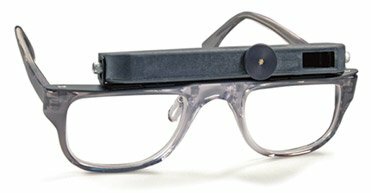 Low vision specialists prefer them because they are easy and convenient to demonstrate and fit, and they can be readjusted at any time. 6. How can someone with macular degeneration try these glasses to find out if they would be helpful to them? Where can one get them? They should consult their low vision specialist or contact Ocutech at 800-326-6460 or the website www.Ocutech.comfor the name of an Ocutech prescriber convenient to them. 7. What is the cost range of this type of macular degeneration glasses and does insurance or Medicare pay for them? Ocutech systems range in cost from under $1000 to several thousand dollars depending upon the device, the customization charges, and accessories. These costs may not include professional fees for the low vision evaluation, the fitting and dispensing of the device or training sessions to help users become proficient in its use. While health insurance often covers examination fees, Medicare does not usually cover the costs of low vision aids, while other private insurance or social service agencies and even employers may. For more information, contact your low vision specialist.